Hilda Hacoobei, This is a guest post by Hilda Hacoobei. Hilda Hacoobei is a designer of experience through travel. Thinking of an innovative and surprising gift to offer to your honey this Valentine’s Day? why not offer him/her an unforgettable and life-changing travel experience where you can ditch your cell phone, savor the moment instead of constantly posting on social medial and reconnect with each other. One of the best perks of having a significant other is the assurance that you have a travel buddy you can always rely on. Traveling always reveals an aspect of ourselves and our significant other that we never knew about. How they handle unknown places, people and cuisine and what gets them super excited, to name a few. It’s a way to build on strengthening our relationships and then wash, rinse and repeat! You can never go wrong with Italy! If you or your significant other is turned off by people who are somewhat spontaneous, then Italy is not the destination for you. Amalfi offers rocky beaches and hidden swimming coves with twinkling turquoise water, perfect for relaxation. If relaxation is off your itinerary, there is plenty of opportunity for boating and kayaking activities. The central Piazza Duomo and main shopping strip are lined with shops selling colorful ceramics, the famous limoncello liqueur and Amalfi’s traditional handmade paper. Amalfi is a maze of alleyways, staircases and tiny piazzas. Exploring these hidden areas is the best way to get a feel for how the locals live the La Dolce Vita in Amalfi. Dining is the foodie’s pleasure in Amalfi. There is a fine selection of restaurants and cafes to choose from along the harbor, in Piazza Duomo or along the main shopping street in town center. Seafood is a highlight of the local cuisine. Freshly caught fish, calamari and gamberi (shrimp) are featured in local pasta dishes and often prepared fresh and simple, yet full of flavor for the main course.The Amalfi Coast’s famous lemon adds its tart flavor to delicious risotto al limone (risotto with lemon) as well as the traditional lemon cake. A meal isn’t complete without enjoying a small glass of limoncello, a strong liqueur infused with lemon rinds that is served chilled. Who knows? Maybe you’ll get a glimpse of George Clooney’s Villa Oleandra while visiting this lovely coast! A UNESCO-designated World Heritage site, Quebec City is dotted with buildings dating from the 1600s and narrow, winding streets made of cobblestones. Experience true romance walking through airy plazas—fountains and statues—as you make your way to Terrasse Dufferin, a wide promenade on the clifftop with fantastic views of the St. Lawrence River below with the Chateau Frontenac, a grand hotel reminiscent of a French castle right on top. Stone fortifications, built by the French and improved upon by the British, circle the old center of old Quebec giving a remarkably different feel from any other city in Canada or the U.S. The walls divide Basse Ville (lower town) from Haute Ville (upper town). Quebec City is famous for eating, drinking and dancing. Cultural events by the likes of Cirque du Soleil, music festivals with free performances, and horse-and-carriage rides take over the city in the warm-weather months. The capital of the province of Quebec, Quebec City has a bon-vivant look and feel that sets it apart from Canada’s English-speaking cities. Almost all Quebec City residents speak French as their primary language almost generally speaking, they will converse with you in English. This is a great place for couples who are willing to compromise. With activities ranging from hiking through absurdly lush monkey forests, swimming and water activities, relaxing messages and even meditation and food, this destination has it all covered. The best way to see the “real” Bali is to head inland, past rice terraces and across the lush countryside. Any of the resorts can be used as a base to explore the island’s sights, however, keep in mind that Bali is not a small island, and unless you want to spend all day traveling, it is a good idea to limit day trips within three hours of where you’re staying. Once you’re away from the crowds of tourists, you’ll have the best chance of immerse in people’s daily living like seeing the island’s many festivals and weddings. Many of the Bali’s interesting sites and villages are off the beaten path, so a flexible, spontaneous attitude is necessary if you want to get the most out of your visit. Western Bali, Bali Barat is a reserve for wild oxen and Rothschild’s starlings and has an offshore coral reef. Menjangan (Deer) Island, part of the park, is a haven for divers with spectacular wall dives and excellent snorkeling. Bali is also one of the top surfing spots in the world. Kuta offers some big waves and a beautiful beach. There are plenty of white-water rafting and cycling tours around the central rivers. There are numerous spas throughout Bali, usually inside luxury hotels and resorts. Treatments are offered in individual spa cabins or villas, with private soak tub, shower and changing facilities. Services include traditional facials, massages and body treatments, usually initiated by a sacred Balinese foot bath ceremony. Medi-spas are also available for Botox injections, fillers and chemical peels. 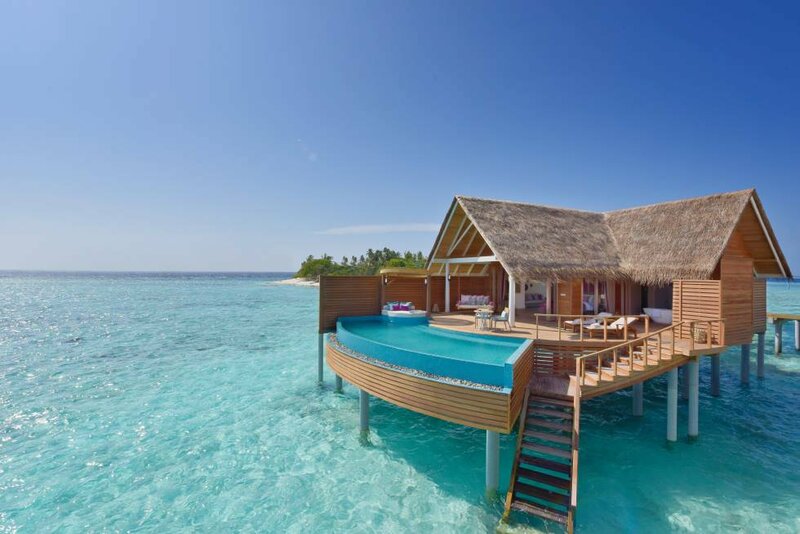 You won’t have to travel half way across the globe to stay at overwater bungalows any more. El Dorado Maroma, a Beachfront Resort by Karisma, recently unveiled 30 overwater bungalows in Riviera Maya. This is adults-only, all-inclusive property located in one of the top rated beaches in the world, Maroma Beach. Each suite features a glass-bottom floor, a private infinity pool, an indoor Jacuzzi tub, an outdoor shower, a ladder for direct ocean access and an oversized deck with lounge chairs, perfect for sipping margaritas. Playa del Carmen is the main town in the Riviera Maya. There are plenty of large-scale all-inclusive resorts and restaurants including a pedestrian-only main thoroughfare. If you are looking to immerse in Mexican culture and history, you may be disappointed in the Riviera Maya as it is mainly a “touristy” town. As a counter measure, many resorts have added ancient Mayan rituals—such as the temazcal sweat-lodge-like steam baths, massage, beauty and healing techniques and even wedding ceremonies blessed by authentic village shaman—to their amenities base. You can still visit the Mayan ruins at Tulum, Muyil and Coba. The first two sites can be easily visited on the same day. Allow two or three hours to see Coba, which is about 30 mi/48 km inland from Tulum. With its pristine beaches, low-lying jungles and abundant wildlife, the Sian Ka’an Biosphere Reserve is the secret gem of the Riviera Maya. Sian Ka’an is a UNESCO-designated World Biosphere Reserve that protects the myriad species of plant, bird, fish and other animal life that have made up the rain forests of the Yucatan for millennia. Much of the reserve is open to the public, but it is difficult to explore Sian Ka’an independently. The reserve is best explored through a reputable ecotourism company, as the area is rather desolate and terrain is rugged. Ecoparks such as Xcaret, Xel-ha and Croco Cun offer a variety of watersports activities and more opportunities to explore the flora and fauna of the coast. The wild in Tanzania has remained wild because it is protected (thank Goodness). An estimated 28% of Tanzania is designated as national parks and game reserves. Because these spaces are protected—and because they are so wild—the best way to see them is by guided tour, locally known as safari, which means journey in Swahili. Although most visitors spend their time in the wildlife areas, travelers should make time for Tanzania’s other attractions as well. The country boasts Mount Kilimanjaro, the tallest mountain in Africa and the highest mountain in the world that can simply be walked up. There are white-sand beaches on the Indian Ocean along the mainland coast. Then there are the impossibly exotic, evocative islands of the Zanzibar Archipelago, with their intriguing culture, architecture, watersports and wide range of beach accommodations. Tanzania’s smaller, lesser-known parks are dedicated to forests and mountain ranges, primates and birds, and the marine life along the coast. The Tanzanian people are very friendly. Despite the many different cultures, Tanzania has had a peaceful history and an enviable political stability compared to some of its neighboring countries. Tanzania is known for being a safari destination. Serengeti National Park, Ngorongoro Crater and Selous Game Reserve easily rank among the world’s finest wildlife sanctuaries. Although it’s the big five (lion, leopard, rhino, buffalo and elephant) that draw most people to Tanzania, the country also supports the continent’s greatest diversity of large mammals, from monkeys and warthogs to giraffes and antelopes, and the annual migration of 2 million-3 million wildebeest and zebra across the Serengeti plains is the most impressive phenomenon of its type anywhere in the world. Stone Town on Zanzibar, an almost perfectly preserved living Swahili settlement, is today a UNESCO World Heritage site. It has 1,700 historical buildings, more than 150 19th-century balconies or loggias, more than 200 massive and elaborately carved wooden doors. We hope we have enticed you to take at least one life changing journey throughout this year, if not for Valentine’s Day. Please feel free to share our suggestions to friends and family. We pride ourselves in designing memories for you and your loved ones by arranging your travel and concierge from start to finish. If you have any questions, please email us at [email protected] or visit our website at www.mhdjouneys.com. Hi! I am the owner of M&H Distinctive Journeys, a luxury travel agency that handles individual travel as well as groups of all sizes including multigenerational family travel, wine tourism, bike journeys, golf journeys, destination weddings, villa vacations, retreats, corporate incentive travel or just about any other group travel by offering value based service.